translation of the whole page with just a single click. Note: You should choose your language (see the Options section below) before using the extension. Move your mouse over a word or select to highlight it, then press down the Ctrl and Shift keys together. A little pop-up will show the definition of it in your language. The top left corner shows the word or phrase that is looked up. Click on the little speaker icon and you can hear the pronunciation of the word. Blow the speaker icon is the pronunciation in the IPA notation. The top right corner gathers a set of convenient buttons that let you configure the extension, copy/look up text on the pop-up, and close the pop-up. The definition of the word is shown with relevant images on the right side (an optional feature when you activate the Show Images feature). Near the bottom of the little pop-up, there is a "more" link which will lead you to the full definition of the word at the Wiktionary web site. To close the little pop-up, just click on any blank place on the browser, or press the Esc button. The little pop-up must be closed before you can activate another in-line look-up. You have the option to close the pop-up by moving the mouse away, but you need to enable it first (see the Options section below). Use the Wiktionary toolbar button . You can drag this button from the toolbar palette to your toolbar. (See this and this posts for how to add a button from the palette into your toolbar.) To use it, highlight the word/phrase you want to look up and click on the button to reveal its definition. Use the Wiktionary button in the context menu. To use it, highlight the word/phrase you want to look up and right click to show the context menu. From the context menu, click on the Wiktionary item. Open the Options dialogue of the extension. Select or highlight some text on the pop-up, and click this icon to copy it into the clipboard. You can later paste the text to your documents or wherever you want. Select or highlight a word on the pop-up, and click this icon to look up its definition. To go to the Meet the Developer page on Mozilla's web site. There you can make a donation through mozilla.org to support this project. We appreciate any contribution (of any amount) and promotion. To close the pop-up of the definition. It is an advanced feature that requires some manual set-up. After it is properly set up, relevant images of the word you are looking up will be shown on the right side of the definition. It can help you better understand the word and it is scientifically proved that images can help memorizing stuff. Give it a try if you have several minutes to spend. If you choose a language other than English, you have the option to turn on the English definition alongside the definition in your language. Why would one want to do that? Firstly, the English dictionary is the most mature and complete in Wiktionary.org. You can compare the definitions in both language and may get better understanding with the English definition. Secondly, it is a way to learn English. The Google Translate button can be found in the toolbar palette. You can drag and drop it into your toolbar to enable 1-click whole page translation into your own language. See this and this posts for how to add a button from the palette into your toolbar. Alternatively, you can right click to access the context menu, then select Translate Page. Open the Options dialog to setup the extension. The extension tries to detect your language the first time you install it. But you can make an explicit choice here. Below it, you can check the "Look up in English too" checkbox to show the English definition alongside the one in your language. If it is checked, you can double-click any word or highlight a phrase to see the in-line translation. If it is checked, you can double-click any word to see the in-line translation. With this new option, you can uncheck the above Enable select-to-translate option which may cause inconvenience when you want to copy & paste some text from the web page. If it is checked, you can press down the Ctrl key (or Ctrl+Shift or Ctrl+Alt) and move your mouse over the word to view the in-line definition of it. If it is not checked, you must press down the Ctrl key (or Ctrl+Shift or Ctrl+Alt) first and keep it down when you move the mouse to translate a word. If you want to know the technical detail, read the section "What is aggressive mode". This option is for the in-line dictionary. If it is checked, you can close the pop-up by moving the mouse away so that you do not need to click somewhere like before. This option is disable by default so the existing users do not get surprised after the upgrade. This option is for the in-line dictionary. If it is checked, it always uses the secure link to query the Wiktionary. This option helps to avoid the intervention from another extension HTTP Everywhere (see the Q&A section for details). This option is for the whole page translation function. If it is checked, a new tab is opened for translating the page. The page's link is sent to translate.google.com instead of using the Google Translate Element. This option helps to limit the intervention from another extension NoScript. 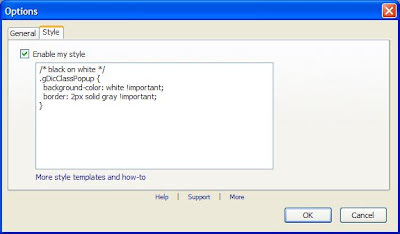 The user can apply his/her own style to the in-line dictionary pop-up. If it is checked, the CSS code in the following input box will be applied to the extension to let user override the default style. There are some samples of the CSS code can be found here. They can be simply copied and pasted into the input box. You can enable the Show Images feature here. See this post for this advanced feature. Wiktionary and Google Translate extension can be intervened by other extensions. Those extensions either block the requests being sent out or alter the requests. So far, users have discovered that Flashblock, NoScript and HTTPS Everywhere can break Wiktionary and Google Translate. 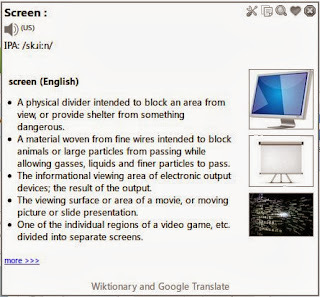 To make Wiktionary and Google Translate works with Flashblock, please read this post. HTTPS Everywhere alerts your request to Wiktionary. The rule in concern is named Wikipedia in its default ruleset. To use our extension, you will need to disable the rule named Wikipedia. If you do not want to disable that rule, you can use a workaround we added in version 5.10 -- in the Options dialog, check the option *Always use secure Wiktionary*. That will always send queries to Wiktionary via HTTPS protocol so HTTPS Everywhere will not try to alter your requests. But since all the sound files are transferred by HTTP protocol only, they will still be broken by HTTPS Everywhere. Therefore, you will not see voice pronunciation icons if HTTPS Everywhere is enabled for Wikipedia. Another reason that Translate Page function does not work is that Google Translate does not support the language you are using. You can temporary switch your language to a popular one, such as English or French, to see whether it is because of the language. There may be more extensions that break our extension. To find out, you can disable the extensions you have installed one by one. The most suspicious ones are those that block or alter things. In aggressive mode, the extension keeps on capturing the words your mouse hovering over at any time. The words are captured but they are not sent out to Google until you press the Ctrl key. Whenever you press the Ctrl key, the word under the mouse will get translated. It adds some overhead but usually does not matter because your browser is idle while you are reading the page. However, if you do not like the idea of keeping the browser active, you can uncheck it. Then the mouse only captures words when you are pressing down the Ctrl key. Whole page translation is blocked by Flashblock extension. That is because Flashblock extension blocks some Google online services. You need to add google.com or the regional Google URL to the white list of Flashblock. There is nothing our extension can do because it is outside of its scope. See the reason and detail in this post. Why isn't Firefox 3.5 supported? Firefox 3.5 is too old to meet the requirement of this extension, we do not plan to add extra fix for it. When realizing the above requirement, you can make a little change yourself to get it installed. Just change the value of "em:minVersion" from 3.6 to 3.5 in the file install.rdf. However, we do not know whether the extension can function properly with Firefox 3.5 and we do not support it. Any suggestions and requests are welcome. If the feature you request does not show up in the new release, please be patient. We will add new features according to their priorities. In the meantime, bug-fixes are our number one priority. I want this tool have the function: when I move the mouse out, tooltip auto close. I miss understood this plugin and thought that its like google dictionary in the google chrome. If it is so then its not showing the meaning. Anyway you can help us by giving the functionality of google dicitonary. Yes, it is like google dictionary in the google chrome, with more features (hover over to translate, detail meaning on google.com/dictionary, etc.). If you have problems using it, I can help if you can tell what language you are using, and which word on which URL you are selecting to translate. Thanks for your reply. I have posted my previous comment. My problem in using this is here -> http://stock1.pho.to/data2/f/5/3/f5364764-1f72-8194-4998-9816a11ab11b.jpg . I dont see the meaning. I see only the word. I have selected option as English and my firefox is 3.6.12. Can i know why is not showing. I wanted to use it like Google dictionary. Using Windows XP 32 bit in Dell laptop. You were expecting an English-English dictionary, which was not supported by the earlier versions of this extension. Please try the new version 1.3. It added this feature. Please add Arabic language support. If only the font size could be bigger. But thanks for the useful extension anyway. Arabic and many other languages are added in version 1.4. Other requested features (moving the mouse to close inline popup, font color, font size, etc.) are very good suggestions, but not first priority in the current stage. Please wait. Now i am satisfied with Firefox, i have moved from firefox to chrome only because of this Google dictionary extension. Thank you for the same. Well in chrome there is another one http://max99x.com/chrome-extensions/dictionary-lookup which i found has options. Some problem i am finding while using the Google dictionary part http://www.codecoax.com/grerc/ enter the passage number 65, try to get the meaning of "social". While using this i dont see the meaning, if i click on more it goes to google translate not dictionary. Specifically on this i have seen the problem. I dont want to use translate at all for English. The accuracy of Google's language detection is out of our control. But we would find a way to workaround it in the future version. Could you add the Polish language please? That works quite long time with the Google Translator. I can't read the tooltip because it has white text. I couldn't find a way to define the colors. i want to translate from english to hindi !! how can i do this ? Sorry that I have updated the images of the description too early. But Hindi was added with many other languages in version 1.4. Great extension. Google dictionary lookup in Chrome was one of the reason why I kept on using Chrome. Would it be possible to disable lookup on select and only keep ctrl-hover behavior? Or better still, ctrl-select would be awesome. Thanks again. Min, you can disable lookup on select by going to the extension's options and unchecking "Enable select-to-translate". 1: feature request: When I disable select-to-translate, could I please then have an option on the pop-up menu instead? Sorry, that's not very clear :-) What I want to do is: select some text, then right-click on it, and choose “translate” on the popup menu. That would make this even more useful. 2: here's a suggestion about how to fix the incorrect language detection: call the translate API first to detect the language for the whole page. You probably want to store that in a variable, of course, so you don't do it all the time (just once per page). Then when you're translating something, try to detect the language for the word or selection; if the language detected is different from the page language, then translate and display both. Alternatively (or in addition to that), you may want to use HTML "lang" attributes in surrounding elements. Polish and many other languages are added in version 1.4.1. The issue of white color text should have been fixed in this version too. how can I set up the font it displayed in the pop-up windows? Lalo, thanks for the support and the suggestion. Sofring, there is no way to change the font currently. I have plans to add features related to the style, but they may come several releases later. The tool is quite good when used as a translation. The dictionary part it works very infrequently as it detects as a different language and then try to translate in English. Why don't you keep an option[in preference] so that your software works as only dictionary or only translate or both[by default]. Well then it would help a lot of people to use it like a Google chrome dictionary. Any way quite a good idea and tool. Congrats and keep doing things differently :). Still in your new version you used the word "googling"!!!. There is no such word in any dictionary. Please put searching translating etc or any other.. Highly impressive the version 1.5 :). Does solve almost all the problems. Hi,I'm very appreciated that, you guys fix the bug which I left in the comments several lines before this. now It can display the color of fonts right. the translated words became "?? ", but before the extension updated, it goes well. Hi, Sofring, one of the reason may be that sometimes the Google Translate URL is too slow. The request gets timeout. Try it some other time and if you still have the same problem, tell me the URL and the word you were looking up. @Zen:You are right!.the translate_url had timeout.I use the foxyproxy to get over the GFW and everything's ok.May I ask which urls are reached when I double click a word and the popup-window showing the answer?I think may be the urls are blocked by the GFW if you know what it is :). and I can define a url_pattern of foxyproxy and let the extension go well. THANK YOU! Sofring, the extension uses Google API at ajax.googleapis.com. Good luck. Now one needs to go to tools menu to trasnlate the whole page. How about some shortcut for it? New button, or menu under right click of the mouse? Here is a feature request. Can you find some to hide the toolbar on page translations. I go to great lengths to preserve screen real estate for dynamic information. Having it shrink to a tab on the left side should do the trick. Here's another thing I've noticed. This is a great tool for Twitter, almost made for it. It's the easiest way to view tweets in many languages on the same page. It reaks down language barriers without even having to click. In New Twitter, the translation bar covers Twitters control/search bar. In both Twitters when you click 'More' the extended page below is not longer translated. Can you have the extension detect the 'More' button in Original Twitter and the automatic 'More' in New Twitter to cleanly translate the following pages? Fix those things, even if it requires special treatment, and you will be viewed as a god. Do you realize how many people use Twitter? Fame and (maybe...) fortune aside, a tool like this blows borders, languages and cultural differences down like a main battle tank. Except for the problems with Twitter, (which is where this extension really rocks) I just spent an amazing hour traveling the world. Can you make the page translation bar follow links. Great for reading newspapers in another language. It also doesn't appear to work on more than one tab at once. Have I given you enough work here? You're really on to something . Run with it. it would be very helpful if options are added to adjust the font size and background colors. it's very important for us disabled people. for example, white text on black work best to increase visibility. otherwise, a wonderful add-on, very handy... i just hope these much needed features are implemented soon. How about a feature to let me get a definition of a word in a definition. e.g. I look up "handmaiden" and the definition uses the word "subservient" and now I want to know the definition for that word. Well, currently, the easiest way to do it is probably to click your "more" link (which is great) and then double-click the word "subservient" to get the tool-tip. Well, it would be really handy to be able to double-click a word in the tool-tip and have another tool-tip pop-up over the previous one or something. It should be helpful if there is a bit of an extension that the user can choose between his native language. Say I'm a Belgian speaking a couple of languages. At one time I want the page translated to English, another time to Dutch. Dutch is my native language, but not seldom is that translation worse than a translation to English. I speak English rather fluently, but my partner doesn't, and so on. So it should be nice if the user somehow can set a couple of "to" languages where he can chose from, without being forced to use the workaround via the add-on itself. please support adjustment options font properties. DQ, in the next release 2.0, you can set the font size. Please read this post. Version 2.0 is already submitted to addons.mozilla.org. It is waiting for the review to be made public. Thanks for fantastic extension. Pure simple and not annoying. I'm just curious if there is any possibility to extend the way how to activate the extension. The only way that is working for me is "ctrl hover to translate" - the others are annoying in my style of work. But I use ctrl + tap on touchpad to open link in new tab. The problem is that on touchpad my tap is usually handled like hover and I get new tab and translated word. I guess that "ctrl+shift+hover" would work for me, but that could different among the others. BigCharlie, you can try Ctrl+hover with non-aggressive mode (uncheck Aggressive mode option) in the current version. That means you have to press down Ctrl key first and move the mouse over the word you are interested in. It is less convenient, but less annoying. Thats exactly the way I use it. The problem is when I want to open new link in a new tab. I hold CTRL and click on the link (on touchpad). Usually (not always, let's say about 70%) link is opened in a new tab and at the same time link is translated, because my click on touchpad is recognized as movement. I need some help. I installed the extension and added the icon to the toolbar. I go to a page (example: http://fylkesarkiv.no/) and click on the icon and nothing gets translated. Any help is appreciated. Thanks. I think you should add new option: hide translation popup on mouse move. At this moment user should click somewhere at the page to hide popup, this is annoying when translating a lot of words. Thanks for addon, it's great! i'm on FF 3.6.13. your extension is conflicting with "FlashBlock 1.5.1.4.2"
Translation for a word or a sentence is ok but when try to translate a web (click on button) its not translating the web page. BigCharlie, in the new version, you can highlight the word(s) and right click to look them up via the context menu. I am also thinking about your suggestion of "ctrl-shift-hover". I am working on the requested feature of "hide translation popup on mouse move". It is a tricky one. I may add it as optional. Anyway I've to say that this addon is making me addicted. So simple - so powerful. Great job. Translation for webpage is still not working in new update .. Dictionary is working fine ..
when I disable "Flashblock 1.5.14" add-one, Translation start working.. kindly address this issue as soon as possible ..
Ch, you need to add google.com to the white list of the Flashblock extension. See the reason and detail in this post. is there any way to hide "Google Dictionary" text in right click context menu ? Bell, not in the current version yet. We could add it in a future release. BigCharlie, Ctrl-Shift-hover option is added in version 2.3. Please give it a try. any advice how I can uninstall or deactivate this yellow "In-line Dictionary" box? I know how to make it disappear, but it is getting on my nerves. It is perfect if in-line translation can also show the Web definitions from wikipedia(and a link to that wikipedia page), which show in the bottom of Google dictionary page. Hi! Thanks for this tool. I've tried to use -moz-border-radius in custom styles. But box become too ugly because of shadows of outer box. Is exist some way to change outer box? Please make it possible to translate words in at least tow languages in the same time. Can you add an option to change the icons to a light color because they are almost invisible on custom themes with a dark background on toolbar, thank you for a very nice add on...it's great. Serg, in the new version 2.5, you can customize the border with round corners. The shadow is added by the OS(Windows). You can remove it by configuring the Windows Appearance. See the details in the style templates post. For the word 'I' I get the translation 'in' which is in some languages correct, but not here. a) I would appreciate, if there would be an option to have two buttons in the pop-up, one button for a drop down menu for the language to translate from and one button for a drop down menu for the language to translate to. Next I move the mouse to word 'tool' and nothing happens, the pop up does not disappear and the new translation for 'tool' does not apear. If I have the pop up for 'tool' then I can move the mouse to the words 'mouse', 'out', 'tooltip','auto','close','have', 'the' 'function','said' and 'Anonymous' and nothing happens. b) I would appreciate, if there would be an option to have a translation already by just hovering the mouse over the word only without any key usuage and while the mouse is hovering the next word the content of the pop up changes to the next translation. c) I would appreciate, if there would be an option to have a translation already by just highlighting a part of any text or word only without any click and getting the translation of what is highlifgted. If I click, the context menu covers the tranlation. d)I would appreciate, if there would be an option to have another toolbar button to enable and disable the above function discribed in b) and c). e)I would appreciate, if there would be an option to have the buttons on the status bar instead of having them on the tool bar, because there is more space on the status bar in my case. Maybe the button is not necessary, but some people might like it. I disable the extension when I visit certain sites. How about allowing us to "blacklist" sites that we don't want the extension to be used on. It would save me disabling the extension everytime I read these sites. Adapt this add-on to multilingual webpage browsing. As a bilingual in English and French, I encounter the problem that I double-click on a french word to get its definition, and the dictionary returns the English definition of the word, as it detects it as an English word. The problem lies in the automatic detection. In my example, the English dictionary has priory over the French one when the word exists in both dictionaries. Could a button be added in the definition box allowing the user to manually override the language detected? Hi. I want to port this extension for Instantbird (www.instantbird.com). Where can i find source code for this extension? Stephane, with the latest version, you can disable the auto-detection in the Options dialogue. See the "Options" section of this online help. Could you please add an option to display the meanings in 2 languages? it would be highly useful for those who's English is not their first language. That way we can read the meaning in English and in our own language, both showing in the popup under each other. Or at least make a key to press t show the other selected language. Please? 1.Automatic translation of page,so they don't have to click the "Gtranlate" icon every time. If you add these features in the near future,I'll be very grateful as my parents will finally be able to surf the English inter-webs. Thx, man, this addon, it is very cool! Great Addon my only pet peeve about it is for the Google dictionary listing in the context menu that cases the menu to increase it's size causing me to open a new window instead of a new tab. I wish that it was just greyed out when it does not apply and normal when it does apply instead of appearing after it can be used, which is usually just as I am clicking on the open tab in the context menu due to the lag. This happens when right-clicking either on whitespace or a word/link. 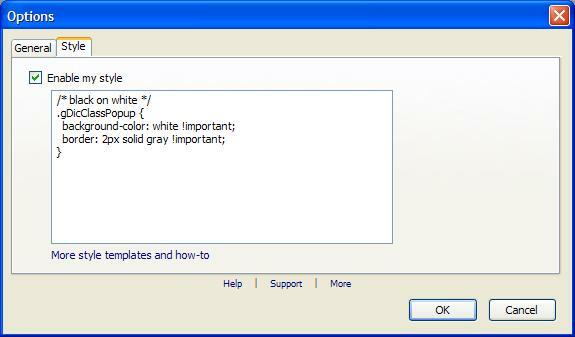 I am assuming that maybe there was a bug that caused an error if a user clicked on whitespace and chose the dictionary. maybe not but if u do change it that may be an area to test after the code is written. Hey, can you add an option to save all the words that I looked up? That would be very useful for learning vocables! Hello. I really like this add-on for Fire Fox. I have one suggestion though. You have a Translate Page option in the integrated pop-up menu but no Translate Selection option. The problem with the "Enable select-to-translate" in the options dialog is that sometimes I want to copy/paste and the translate dialog pops up. I also double click words/sentences/paragraphs to copy/past and the dialog would show up. I would like to see Translate Selection in the right-click interactive menu. Thanks for the good work on this. This is the best translate extention I ever use! After the discontinuity of dictionary.google.com, inline translation is no longer working. Could you release a fix please? Thanks. Google Dictionary is gone. Can you integrate other dictionary service to this extension? It's a good extension. Hope you can fix the issue as soon as possible. This addon stopped working when google dictionary went away. The addon needs to be updated to use the "Define " syntax that google supports. This tool needs to be updated since Google has abandoned Google Dictionary. this very useful extension no longer shows definitions! Google Dictionary has been relocated to Google's search results, so the extension needs to be pointed to the new syntax. please do this soon! Since Google shut down the Google Dictionary service, part of the function of this extension has stopped working. We will look for and test other alternatives. Please be patient. In the meantime, you can still use the translation feature of the extension. this is not working with any sites other than facebook and mozilla addon sites. the behaviour is same like the old google dictionary addon. not working even thru the context menu wikitionary. on clicking the more option it goes to the site and works. i mean its not working thru the inline popup option except for those site i mentioned above. and thanks for useful addon (at least for me :). I've got a question, though. When I invoke Google translation bar, I can't select another language on it. Drop down menu contains always only one language (for me it's Czech). Sometimes, machine tranlation is incomprehensible and I'd like to choose English as a target language "on the spot". Is it possible with current version? i do not want to go there, much rather to google translator!!! Firefox 7, Ubuntu Linux 10.4, add-on updated. Even though I have (and have had always) the option not to use auto detect and only look up words in Spanish this does not work. Many words exist in different languages with different meanings, I only read Spanish articles. As it is the add-on is completely useless to me because most of the words I click register and Esperanto or Romanian or Catalan etc. etc. and when I check in a dictionary like Spanishdict.com afterwards I find the Spanish word is completely different. It also keeps looking up words in English, and that's not ticked either. Thanks for this add on, I loved it, it helped me learn so so so much Spanish, even though it hasn't worked at all recently. Returns only ?? when I set the language to Finnish (Yes, Finnish is supported by google). Works normally when set English to English. Google Translate API has been officially deprecated (https://code.google.com/apis/errors/). As a result, you will see "??" if you are not using English dictionary. We are looking for a solution. If you have any suggestions, don't hesitate to let us know. The English dictionary works as before, as it uses Wiktionary. Any news on the ??? problem? It's a shame google did whatever it did that broke this add-on, it was very very good. Any new on the ??? problem? It's a shame to see such a great add-on broken by something google did, it was really good when it worked. Seems that a lot of words didn't show up or don't translate. Is it permanent error? May be connection "lag" with google dictionary? I am talking about Rus->Eng translation. P.s. I like this useful plugin! Thank you! The "??" problem has been fixed in the latest 4.1 version. You can download it from the "versions" link in the very beginning of this post. If you prefer to wait for the review of the Mozilla team, please be patient. I have no control of that. Hi manni. Have you selected your language in the Options dialog? awesome bro, the wikipedia dictionary is good. //here i think the link for the new google dictionary. I'm trying to translate this korean page http://cafe.daum.net/pot-tool using the menu Tools>Translate page, with no success. My language is Portuguese, it is the language selected in the Firefox Extension Options. I filed this bug for Venkman before installing the translator, and now the same thing is happening to the Wiktionary button on a separate profile. Steps to Reproduce: Install, and place the button on the toolbar. Doesn't look up definition when HTTPS-Everywhere extension is enabled; it redirects to wikipedia HTTPS connection. When i disable wikipedia redirection, then your extension works. When using this addon, I'm having a problem which I can not understand. If I lookup the word "language" in Wiktionary on the page https://addons.mozilla.org/en-US/firefox/addon/google-dictionary-and-google-t/, it works, but if I lookup the same word on the page http://www.ampl.com/, I do not get any definition and the spinner does not stop. Any idea why that might happen? Hi H. Turgut Uyar, I tried your web site and it worked. Maybe it was your network connection problem. eXtreme, that is a very good suggestion. Remind me if you don't see it in the next two releases. I know this tool is helpful in many issues, but sometimes it really annoys me specially when I wanna copy or paste some content. Can you please inform me, how I can uninstall this from my firefox. I don't find it on the list of extensions. Hasmat, sorry to know that it is not helpful to you. Have you tried to deselect the select-to-translate and double-click-to-translate options? That would prevent the popup when you copy&paste words from the page. If you still want to uninstall it, you can find it in the Extensions list with the name of Wiktionary and Google Translate or Google Dictionary and Google Translate (depending on which version you are using). Its icon is a big blue G.
Thank you so much for your work!! Please add indic Languages like Gujarati and Urdu. Just to say thanks - one of few add-ons without which I cant use Internet, read or write online. Thanks for excellent work ! For some reasons, translation by button and right click doesn't work anymore. I don't have any other add ons installed besides this one. Can you give details? Does the popup show up? Do you see the spinner? What platform/version/language are you using? etc. Add an option to existing select-to-translate: only translate when a key, for example CTRL, is hold. I know the "Wiktionary" toolbar icon is easy enough to use, but adding another option doesn't hurt. BTW, you can make the Wiktionary icon appear on the Navigation Bar by default so that more users will realize its existence. The idea is close to what eXtreme suggested except that he/she was asking for hover-to-translate option. With the latest version, by disabling select-to-translate and enabling hover-to-translate, you can select a word/phrase/text, and press the Ctrl to get it translate. Thank you Zen. need to use hover-to-translate with aggressive mode for it to work. Can you make it work without hovering over the text? i mean selecting the phrase while holding ctrl, or selecting then press ctrl to translate, without hovering over. ---OS type and version: Windows 7 64-bit Ultimate. ---The version of the browser: Firefox 14.0.1. ---The version of the extension: Wiktionary and Google Translate 5.10. ---The steps to reproduce the bug: see my explanation. My apologies for reposting but I completely forgot to select first the Firefox add-ons, then the Wiktionary and Google Translate add-on! Here is an issue that seems to have appeared only recently. As, if I remember well, at a previous version of this add-on, it used to translate the particular web page at http://www.haaretz.co.il/ perfectly fine using the Google button. At this page at http://www.haaretz.co.il/ (in Hebrew), I can try to press the Google button to translate it and it simply does not translate it into English!! Same problem if I do Tools, Translate. Same problem if I take a link from this web page at http://www.haaretz.co.il/ and try to see if the Google Translate button would work fine through a link from this particular page at http://www.haaretz.co.il/ . It does not! On the other hand, if I go to Google translate at http://translate.google.com/ and put the web page address http://www.haaretz.co.il/ in the field for that, it does translate the page just fine!! More, if I try to use the Google Translate button with another page in Hebrew, for instance at http://www.ynet.co.il/home/0,7340,L-8,00.html . Then pressing the Google Translate button works perfectly fine!! So many thanks for your add-on. It is amazing. 1) First improvement to add. As you can see, I have just added: "Into: (the foreign language should be stated here)". Many times, I have no clues whatsoever which language it is translated from and that bothers me a lot, as I speak several languages and at least I want to educate myself further at recognizing foreign languages that I do not know. 2) Sometimes, there is just a few sentences in a foreign language in a page that is mainly in English. I select the sentences, move the mouse cursor over them, and click Ctrl+Alt but it does not give me the translation for these few sentences in a foreign language. Thanks a lot to consider adding this important detail 1) at the next update. For 2), thanks to have a look at it. many thanks from Iran ,guys. Thanks for your support and suggestions. 1) This extension is an interface that relays the service of Wiktionary and Google Translate. The Google Translate bar is built by Google Translate so the extension has no control of how it is like. 2) To let Page Translation work on more pages, you can enable the *Translate page in a new tab* option. 3) If some sentences are not translated, that may be because neither Wiktionary nor Google Translate can translate them. You seem to have completely forgotten to answer to my first posting that I reproduce again for you below. In particular, why the Google Translate button does NOT work on this particular web page at http://www.haaretz.co.il/ . Despite the fact that when I go to Google translate at http://translate.google.com/ and put the web page address http://www.haaretz.co.il/ in the field for that, it does translate the page just fine!! Completely illogical!!! Thanks to answer this particular point. Again, thanks for your great add-on. MichaelIsGreat, in short, the solution to your question is: you can enable the *Translate page in a new tab* option (Open the Options dialog and you can see this new option). If you are interested in the detail/reason, read on -- by default, our extension use the Google Translate Element for translating the whole page. Unfortunately, it doesn't work on all pages, especially those with frames. It is possible that it ever worked on a web site before but stopped working on it after the web site got updated using frames. It is not the upgrade of our extension breaking it. It is the web site's updates that breaks it. Google Translate Element is a Google's product so we cannot provide fixes to that. However, we have a workaround which I mentioned in the beginning of this answer. It uses Google Translate web site for the page translation instead. Although it does not look as pretty, it should work for you. Thanks for the extra explanations. You are right, I tried your idea of using "enable the *Translate page in a new tab* option" and it is now able to translate perfectly fine the particular web page at http://www.haaretz.co.il/ for which I had problems. That should be sufficient for me. Thanks for your great add-on. I love using it. Wow this addon is great. I'm using the tooltip to translate words from English to Hebrew, which works great, mainly as a learning tool. I also using Google translate service to translate full pages in German to English, as German is translated to English better than to Hebrew (surely with technical text). The issue is that when setting your addon to translate to Hebrew (with English as secondary) and translating full page it translated to Hebrew and I can't switch the language on the Google translate Gui (Hebrew is the only one on the list). I'm guessing you can't change the way Google translate works, but you can add an option for using different languages in tooltip mode and full page mode. Thanks for the addon, please keep it alive, it's great and much better than using than heavy and slow Babylon. Keep up the great work, success. first thanks a lot for your unvaluable tool. Stopped working for no apparent reason ! Today I can't see any input in popup window ?! The popup doesnt show anything anymore, other than the word(s) you selected - selection of the word brings popup but without input from Wiktionary or Google dictionary !!! Some other user also left same complaint on extension page at the Mozila Add-on website. Santa, please update to the latest version 5.12 which has fixed the recent issue. This is a great plugin! I just have one minor comment. The mouseover for 'deliberated' tells me that it's the past form of the verb 'deliberate', but then only the adjective meanings of 'deliberate' are listed. • Done on purpose; intentional. • Of a person, weighing facts and arguments with a view to a choice or decision; carefully considering the probable consequences of a step; circumspect; slow in determining. • Formed with deliberation; well-advised; carefully considered; not sudden or rash. • Not hasty or sudden; slow. The adds-on seems not funciton well. Translation exceeds the whole webpage margin and only small part of whole translation can be availble if taskbar is placed on right side of screen. what we hope for is the same as feature as the following picture shows. I suggest to add an additional option to make the full pop-up box displayed above the selected/double-clicked word (now the only choice is beneath the word). That is what Google Dictionary (by Google) in Google Chrome does by default (though it doesn't give another option)! In fact, if users have another pop-up extension like Diigo, which also has a pop-up triggered by double-click, more than one pop-up items will overlap at the same time. Hope you can provide this option, and hope it will not be hard to implement. Big thanks! and I’m impressed! Extremely useful info particularly the last part :) I care for such info much. I was looking for this particular information for a long time. Thank you and good luck. Is there a workaround / explanation available why translation doesn't work when editing files located in Google Drive? Example: I am having some document saved in Google Drive. When clicking them, Firefox is started and will allow to view an edit the file. However the translation does not come up, no matter what options I select for the add on. Besides that, great and lovely tool. This won't translate phrases anymore. It can translate one word if you double click it. However if you select the whole sentence it shows loading but no result. I've tried this with a few sites and it does the same thing. I click on the magnify glass icon and it takes me to wiktionary which is why i think it won't work. It should be requesting translation from google translate. 1. Select-to-translate makes copying text impossible. I may close the translation popup but it pops up again if I right-click to copy text, disabling "copy" in the context menu. Not sure why it disables text copying. 2. Translating whole page is locked to the main language selected in options. There is a dropdown menu to select a language, but it has only one language. I usually need translate to English with whole pages because Google doesn't translate longer phrases well to my native language. It would be nice to have a REAL language dropdown menu there. Also, the full-page translation button should indicate which plugin does the translation. Since it fails on many occasions I use other Google Translate plugins and it took time figuring out why there's a limited-function Google translate button in my toolbar and why it is locked to one language/which addon it belongs to. I thought it had something to do with my Google site settings and spent ages hunting it down. 3. Often fails to get a translation even though Google has it and other addons CAN translate the section. Particularly happens if I choose non-English (Estonian here) as main language and check the "search English too" checkbox. The popup just stays empty. 4. Breaks on some longer passages and translates only the beginning. First sentence usually, it seems. Thanks for this great extension indeed. And I want it to give the Arabic word match too like it does in the other website pages. So plz help me with this little problem asap. Thanks for your awesome work. Where is the story of the search words? After I read what aggressive mode is, my question is, Can't it really translate the word under the cursor when you hold it on this word, without having to click any hot key, like say adding the option "none" among the suggested hot keys in "enable hover-to-translate with key"? Hi Nilionova, You must use one of the hot-keys combinations to use the hover-to-translate feature. 1) Could you allow the user to select a few words or a sentence or even a paragraph and using Ctrl+Alt (the option I use to start Google Translate), I would then be able to have the full translation displayed in a yellow small window, without having to open a new tab to see the translation of this longer sentence or paragraph. So far, I can only managed to translate a single word at a time using Ctrl+Alt to trigger Google Translate and that is not enough at all. 2) Google Translate (using the button) does not translate the comments that appear on a page. 3) Because Google Translate has been abandoned by Google, you might want to give a choice to the user of this add-on to use a different Translate tool. Maybe a similar tool than Google Translate is also usable with Bing Translate or Babylon Translate? Thanks to consider these suggestions. Many thanks to the developer of Wiktionary and Google Translate. Thanks for all the suggestions. I assume you are using the latest version 6.3? Are you not translating from/to English? It is a surprise to know that Google Translation is abandoned. We will consider your suggestion of alternatives. There is a problem in traditional Chinese version. Some Chinese is in simplified Chinese but not traditional Chinese. That is because the result returned from wiktionary has the simplified and tranditional Chinese characters mixed. The current version of our extension does not detect them. In a future release, we may consider adding the detection. Great extension on many aspects: easy to use, non-obstrusive (the best in that regard), and doesn't destroy the original page layout. Also, links clicked remain in their original language, which is generally better. 1. With Firefox 19-22 (even on a new profile – no experience prior to Firefox 19), when I right-click on a menu, it is *sometimes* empty or partly present. It sometimes happen 10-15 times in a row, other times I can be a 100-200 clicks without problems. And it never happens if I remove the extension. My setup is Windows 7-64 bits (French). 2. Word translation is a bit aggressive, so I disallow it. I would suggest 2 other options: control-shift-alt-click, or even select word and either click on icon or right-click on menu to see the translation tooltip (that's what I would use). 3. As a French-speaking guy fluent in English, I would love to right-click on the icon and get the preferences – or at least the selection of destination language. For most languages, Google does a better job in English, but there are a few where the French translation is better. Thanks for the brilliant tool! It's really helping me with learning Icelandic. I have one small request - I'm running it in FF on OS X and would like to select multiple words and control-click them to translate. Unfortunately, OS X treats any combination of cntrl-click (even with other modifiers) as a 'right-click' context menu. Is it possible to add an option to make it command (apple)-click? I think shift and alt do different things in OS X. Many thanks for your incredibly useful extension! Je voudrai juste vous remercier ! I just would like to thank You !!! No other addons like FlashBlock or NoScript are installed. Is there a way to change the size of the window so as to be wider? First of all, thanks for this add-on! I really like it. As I understand it, it is supported on such an old system and indeed, all the basics work perfectly, but the advanced features don't do anything. - and the Wiktionary context menu item is always enabled, even on pictures or when nothing is selected at all. Thanks again in advance, and hopefully these bugs can be fixed to make it perfect! 1. Add targetApplication node to install.rdf file. 2. Specify "chrome://messenger/content/messenger.xul" in the chrome.manifest file. 3. Change appcontent to messagepane in the gdic.js file. It would be nice in the owner of this plugin will apply such changes in future version of this plugin. There are some dietary problems. shrinking so that all lines in one long line and confusing. b. What good if you could cancel Lhlothn the pop-up. Or control the size. Because it is a very large scale. And many times it hides the text. c. If you can create a radio button on the taskbar. Adding an option to save all the words that I looked up would be very useful for learning words! Agree with last comment, remembering all the words looked up and exporting these words with definitions in csv file will be helpful when learning a foreign language. Thank you for developing this wonderful tool. Is it coming to android too? We may have an android version in the future. But there is no firm plan yet. Can you please add an option to force HTTPS? Very fine until it stopped working. Google Translate works but Wiktionary does not work. I use Windows 7 64 bit, Pale Moon browser. Everything updated. No longer works. When I click/highlight a word, the box pops up but there is no definition. Translations work fine. About a week ago, Wiktionary and Google Translate stopped working. The tooltip displays the word I'm trying to look up, but there's no content. Translation appears to still work. Dictionary is not working. Double clicking the English words no longer shows the meaning. And few non-English words are translated but without showing meaning. Seems like wiktionary no longer works, only g translate. In pop-up there is no English translation, despite the "Look up in English too" is checked. Hi all. We are aware that this extension is only partially working due to the change of the wiktionary API. We will release an update later. Any plans to make an add-on for Google Chrome for Wiktionary/Google Translate? I personally think this is the most convenient and efficient extension for Firefox, and I'd be glad to see it ported to Chrome as well. 1. Would be cool to have: HOLDing down the CTRL key, then right clicking the word -> translation popup. 2. It would also be helpful to have a link in the popup that opens the google translator page directly with the text. 1- Long text translation should be possible. Thanks for a great extension. I have suggestion: Would it be possible to make the double click functionality also work inside the popup box? Sometimes the Wiktionary explanations in English use words that I do not understand either, so I want to double click on them to look them up too. Sometimes, for instance, I double click on a word in plural form, and Wiktionary just says that it is plural of the singular form of the word, but not explaining what the word in singular form actually means. In that case I want to double click the singular form to look it up. Hi Jesper, to look up a word from the popup box, you can click on the little "search" icon at the top right corner of the popup after you select the word in question. 1 - Can you add the "SHIFT" (only) option in shortcut possibilities ? ("CTRL+SHIFT" is uncomfortable when done a lot and CTRL+C/V/... make trouble with "CTRL" alone ; "SHIFT" does not interfere). Con Wiktionary and Google Translate facevo traduzioni di pagine intere di posti di Twitter. Dopo un recente aggiornamento di Adobe Flash Player, HA SMESSO DI FUNZIONARE. Non riesco più a farlo andare. With Wiktionary and Google Translate did translations of pages of places to Twitter. After a recent update to Adobe Flash Player, it stopped working. I can not get it going. Your Wiktionary add-on is a dream come true, with one minor exception. The activation buttons of Ctrl, Ctrl-Shift and Ctrl-Alt, interfere with AutoHotkey which I need and use extensively on Wikisource. I also use "ItsAllText" add-on, which permits the user to define their own hotkeys. Please consider some kind of an option to allow the user define their keys. Thank you. making changes to the 'style' affects the Mozilla builtin 'Page Inspector' as well. so, if you change the font color, size, style, the change is reflected in Page Inspector. I made the font-size bigger in your Popup and the text in Page Inspector was HUGE. Other than that.. I very much like your dictionary/translator pop-up add-on. there's a problem with the window size. after that the window size of wiktionary will stay wayyyyyy too big, even if you select just one word. So from the picture you should got it - the huge window with a background (either white or black - as on the picture). It's not all the time like this. But it happens very often. What causes that - no idea. The problem is temporary could be solved by restarting the browser. But it helps just for a while. Comments on how to reproduce: no idea, just use it for a while. I am getting the window by pressing ctrl+shift (it is setted aggressive mode). 3) Some others that should cause an uncompatibility. Looking forward for the repairing. ok, now with firefox 45 it completely stops working. sadly this looks abandoned, so we need to look for something else. I can confirm that this add-on doesn't work with Firefox version 45.0-1. After downgrading Firefox with pacman to version 44.0-2 it works fine without any issue. With Firefox version 45.0-1 the translating window will open but never show a result. Thanks for the patience and the kind support. Thank you for developing this wonderful tool! I use the extension for hover-over with mouse translations. The problem I have: it shows a definition for the word in every possible language, while I only want French words to be defined, in English. Is it possible to fix? Thank you for this addon. It is very useful. However, there may be a problem with version 7.4 while translating https pages. I get the error "cannot translate encrypted pages" however when I reverted back to version 7.3 it works fine on the same pages. the bug posted by Jimmy Bondy above seems to br gone now! thanks a ton for your effort! my addons have no voice! How to configure it? First: thank you so much for this extension! I've had to migrate from Chrome to Firefox because of many issues that appeared once i upgraded to Windows 10 and i was really missing the Dictionary extension for Chrome. Second: A request. Could you make it that you can activate the search for meaning on words from the popup box of your first search? For example i searched for the word "shimmery" and the result i got is "appearing to shimmer". Now since i still dont know what shimmer means i want to search for the meaning of it by double-clicking on the "shimmer" of the "appearing to shimmer" string. I hope this all makes sense to you haha. You can select/highlight the word ("shimmer" in your example) from the popup box and then click on the little Search Icon, which is at the top right corner of the popup box, to see its definition. Is it possible to disable the popup on certain sites (configurable)? I like to enable double-click translation but it becomes annoying when working with google sheet. Hello! What version of .NET Framework is Wiktionary using, if any? My Windows 8 can't work with .NET Framework 4.6, I'm not sure did Windows update framework version because of Wiktionary or some other program, I installed many at once. My computer stopped playing videos properly because of the framework update, I had to uninstall it. I'd like to install Wiktionary again, but ofcourse I shouldn't if it needs the 4.6 framework. Btw, do you think you are going to keep the same version in Wiktionary (framework version)? This is a Firefox addon. It does not require .NET.